Homeowners all across Canada are coming up with new and creative ways to repurpose part of all of the space in their garage for more than just parking their vehicles or using it for storage. With these changes, it is essential to ensure you have the right type of garage door to protect your garage and home from the elements. From insulated doors to vertically designed doors, the garage door you select should be directly related to how you use your garage. Let’s take a look at some different ways you could repurpose part of all of the space in the garage in your Canadian home! Your garage can be a great place to meet your fitness goals for the New Year by setting up your own fitness centre in your garage. You can use part of the space for weight benches, treadmills or other types of exercise equipment. Just make sure you have a well-insulated garage and garage door. If your kids’ toys, books, and games are taking over all the rooms in your home, why not consider building them their own playroom in the garage? It is easy to add some shelving, arts and craft table, and other things your children enjoy in the garage. You will want to add padded flooring tiles or carpeting over the concrete floor, as well as make sure the space is properly insulated. It is not uncommon to have totes full of your arts and crafts materials or hobby items that you have to haul out and then put away so you can continue to use your dining room table for meals. If you enjoy various arts and crafts and other hands-on hobbies, like building model airplanes, then you need a space you can enjoy all the time, like using part of the garage. If your kids are learning how to play various instruments or you like to relieve your university days with weekend jam sessions with your friends, the noise inside the house can be distracting to others. You can build a music studio with insulated and padded walls to keep sounds from traveling too far. Just remember to also get a new garage door with sufficient insulation. Your teen will want their own space where they can hang out with their friends. 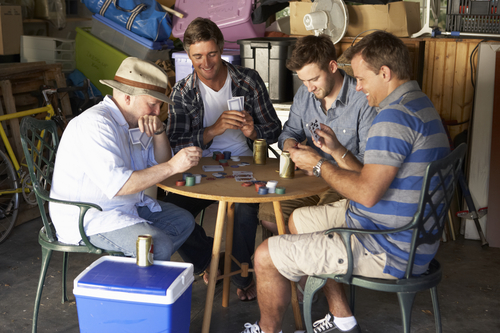 If you are worried about where they are hanging out away from home and want to make sure they are safe, you can use part of your garage to build them their own hangout zone. You can paint the walls, put up some cool lights, toss in a mini refrigerator and other things to make a spot where you teen will want to spend time at home with his or her friends. As you can see there are all sorts of ways you can repurpose part of all of your garage for other uses. To make sure you have the best garage door that fits how you use your garage, please feel free to contact Richard-Wilcox Doors at (800) 667-1572 today!